The new JL will surely have its share of bugs to work out. As they will be offering a new engine, transmission, suspension, aluminum components, and a crazy 6-piece hardtop? They are still working out kinks now on the 3.6 with the bad heads, and oil filler tubes, clock springs, mirror heaters etc. Every time a redesign comes out, it takes the Jeepers a good 5 years or so to finally quit laughing at it. And when it does, JK aftermarket parts should drop in cost. It has proven so previously, anyway. If you like the 15-17s go for it. The damn things are almost worth more used than they are new. So if the '18 blows you away, trade up. That gives you a couple of years in one you wouldn't have had. I wouldn't trade my last 2.5 years in mine for anything. It's like having kids, if you are waiting for the perfect time it may never happen. If I were in the market for a new wrangler right now I'd wait to see what the 2018 has to offer. If you like it, buy one. If not you'll be able to get a great deal on a 2017 since everyone will be buying the 2018. The JK and JL will probably be produced at the same time for a while in the 2018 model year, and I personally don't expect to see a huge change between the models. The big changes are going to be in the form of aerodynamics and fuel efficiency. I doubt capability will change much if at all between these two jeeps. It sounds like the JL will get a new style of Dana44 but it won't be much different. As far as modding the big rumour was that the front bumper mounts would stay the same, I doubt that will be true but if it was it will make moving to a JL a lot easier. The biggest changes for the JL outside of powertrain options are most likely going to be the interior. And that's fine as it's much needed. It'll get the modern instrument cluster with a center display, the UConnect 8.4, keyless ignition, and (probably) the Selec-Terrain knob for the transfer case. Other amenities as options will probably be adaptive cruise control, blind spot monitoring, and a rear camera. The Wrangler has always gotten the "hand-me downs" of offerings from the Grand Cherokee after they've been in a model for a couple years and the JL won't be an exception to the case. However, as others in the thread have mentioned, it'll be a first model year and it'll be rife with bugs. Bugs in a first year model are normal, but Chrysler has a knack for having them to the extreme. FCA keeps shitcanning people in charge of QC. So, as great as the JL will be, you will want to wait a year or two for them to get somewhat ironed out. The JK didn't become a fairly solid and confident vehicle in the quality control department until well after 2013 and even today it still isn't perfect. Last edited by Spank; 11-03-2016 at 10:42 PM. I bought my first jeep, a 2007 JK, shortly after they were released. I spend the next 9 years dealing with bugs such as burning oil and throwout bearings that I could never fix. I decided that I wanted to get a new Jeep, so I decided to jump on the 2016's to ensure that all of the bugs were out and not have to deal with more bugs in the new model. The 2016-2017 are now on year 5/6 of the new motor, and 9/10 of the same basic design. Most of the bugs on the JK should be sorted out for the brand new ones, wheras on the JL, nobody will know until after a few months of forum postings exactly how many bugs that has. My advice is that if you are seriously looking and don't need the newest, greatest, thing, to consider a 2015/16/17, and hold off on the newer design for a couple of years. Dont do like myself and a bunch of other 2007 owners did and jump on the brand new ones and spend the next several years dealing with little bugs. My 08 hasn't had much trouble. It's been my favorite of all vehicles I've ever owned. I'll give the JL a year or so and then get a 2019 or maybea 20. I decided to get the JK rather than wait. I really like the RUbicon I test drove. While I was there, the salesman says, "Hey, we just got this in on trade and the guy just had us install about 6K worth of accessories and then decided to trade for a truck." I inquire as to price, and as it worked out, I ended up with it and unlimited mileage lifetime waranty and free lifetime oil changes. The Rubicon was a certified pre owned still under original factory warranty. 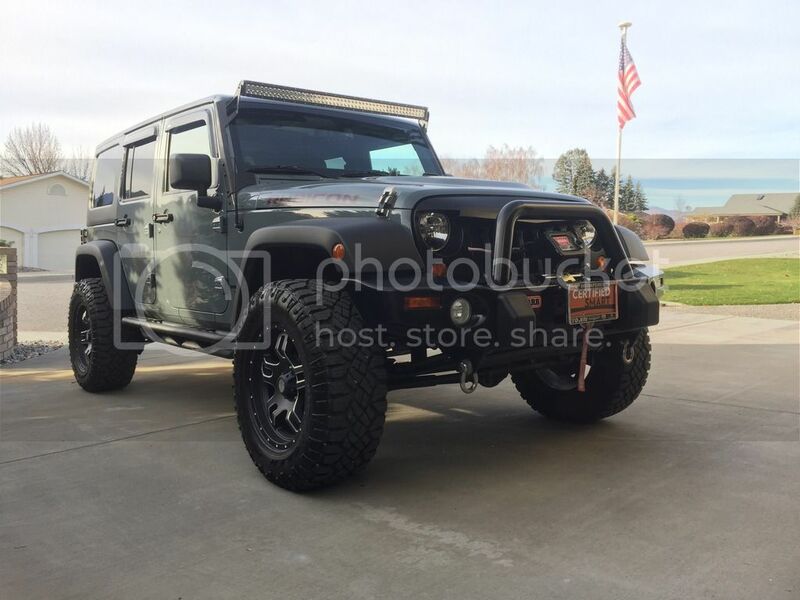 The accessories are as follows - Mopar 2" lift with Fox shocks, Warn 9.5xp winch, ARB front bumper, Jeep upgraded side rock rails, rear tail light guards, aFe exhaust, S&B air intake system, 5 American Outlaw 18" wheels, 5 Goodyear Dura Tracs, back up camera(run through NAV on dash), DVD(also run through nav on dash), Rugged Ridge window lips, Rugged Ridge radio antenna, Mopar LED light across front top f cab with Mopar mount, Jeep gas cover, Jeep slush mats, Hardrock hood, and I know I am forgetting something. Here it is below . My question is that I have found very little information on what the 2018 will be, but not coming up with much. Maybe it's just too early, I don't know. I got the 2011 with the new interior, glad I did. I plan to trade for the new JL when it happens - I personally believe the first model years are the better buys. The first year is the most important to get the quality right, because everyone is watching - if they put out a lemon, sales never recover till they re-design. With first year success declared, THEN the accountants start driving cost-cutting measures that result in bugs and loss of quality, secretly. hrm... and yet the 2012 and the 2007 and the 1997 and the 1986 were all problem years.